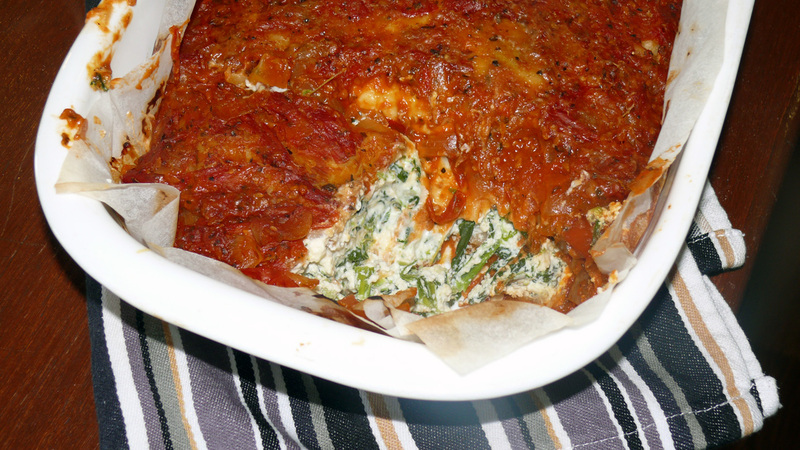 Allow me to add the 10 trillionth recipe for spinach and ricotta cannelloni to the internets. I wouldn’t bother if I didn’t think my cannelloni was worthy. It’s a popular dish that everyone seems to have their own version of – like bolognese or fried rice. My version takes no shortcuts – you make the tomato sauce, no pre-packaged fillings and if I’m in the mood, fresh homemade pasta. 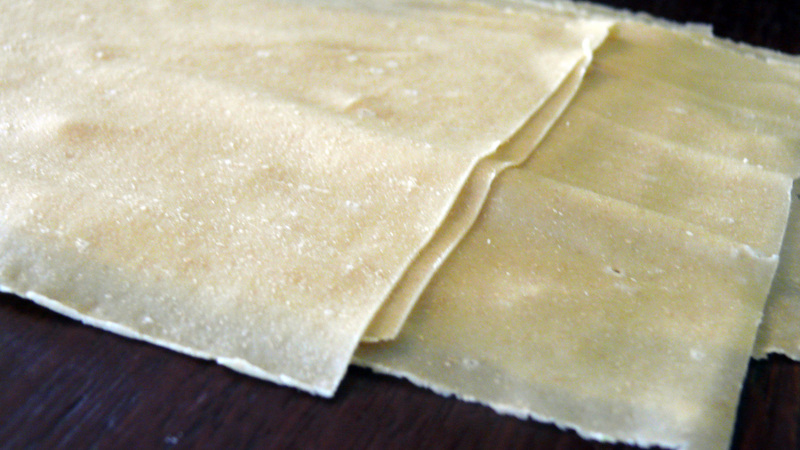 If not, I’m happy enough with store-bought fresh pasta sheets. I made fresh pasta for this version and got to use my favourite thing ever – my KitchenAid pasta maker attachment. It was a gift from LL for Christmas. Even though he was dead set against me buying a KitchenAid mixer (“who would spend that much money on a kitchen appliance?”), he has found it useful when he’s stuck for gift ideas for me. I’ve got the ice-cream bowl as well. Thanks LL! Anyhoo, I took the opportunity to make some fettucine and spaghetti seeing as I didn’t need to make a whole batch of pasta dough for my cannelloni. I used the pasta cutters and air-dried my pasta and froze it. 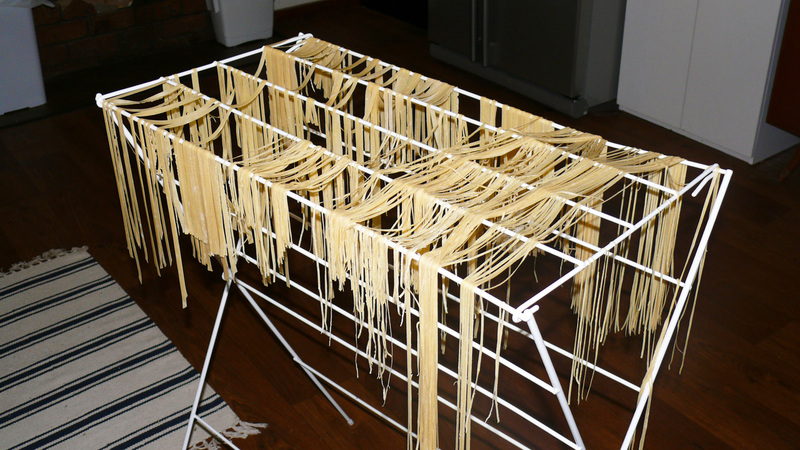 It’s always nice to have fresh pasta on hand, I spreckon! And yes, that is a clothes horse. What of it? 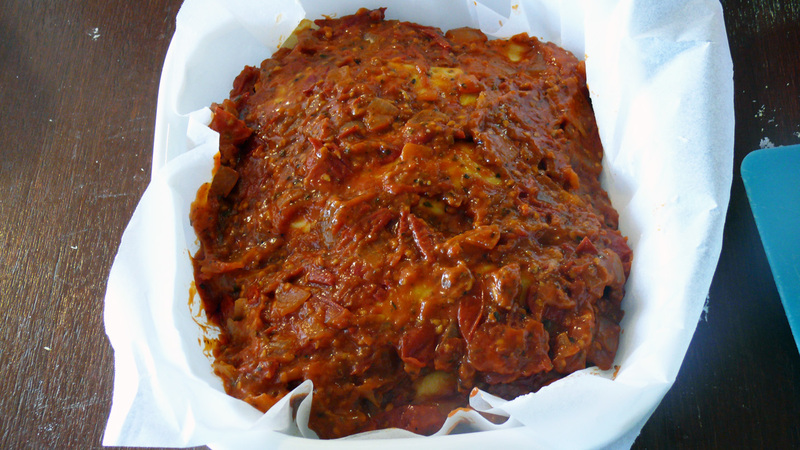 I like to make my tomato sauce – in a huge batch – the day before I want to cook my cannelloni. 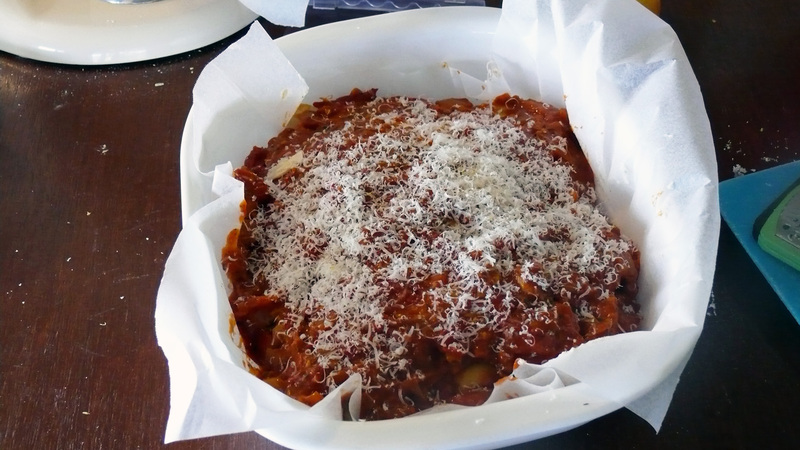 Not only does it give the sauce time to infuse all the delicious oniony, garlicky and herby goodness, it makes putting the dish together a breeze – especially if you’re going with store-bought pasta sheets. I used 800g of cherry tomatoes from our veggie patch to make this tomato sauce. I threw them in whole and mashed them with a potato masher after they’d softened a bit, so the sauce has a delightfully chunky consistency. When tomatoes are out of season I use diced canned tomatoes, or fresh tomatoes if I can get a bag of them on sale. I would probably chop them or pulse larger tomatoes in the food processor first, though, but do whatever works for you! It also goes without saying that cannelloni makes AMAZING leftovers. Being a night shift worker who lives 30 mins from work (yep, no going home on my break), I usually spend my mornings before work cooking lunch and dinner for me and the boyfriend so we don’t resort to eating junk food or takeaway. I’m also SUPER organised and food and sewing are pretty much on my mind 24/7, so it makes sense I’d be all over pre-cooked dinners like white on rice. I digress. So, as I was saying, this reheats extremely well, but is of course just as delicious when prepared and cooked on the same day. Heat oil in heavy-based saucepan over medium heat. Add onion, garlic, bay leaf and oregano and cook, stirring, for 3 minutes or until softened. Stir in tomato paste and cook for 1 minute. Pour in wine and when it has evaporated, reduce heat to low and add tomatoes. Cover pot and simmer, stirring occasionally, for 30 minutes. Season and set aside. NOTE: If you pre-cook your sauce you might want to zap it in the microwave before assembling the cannelloni to speed up cooking time later. 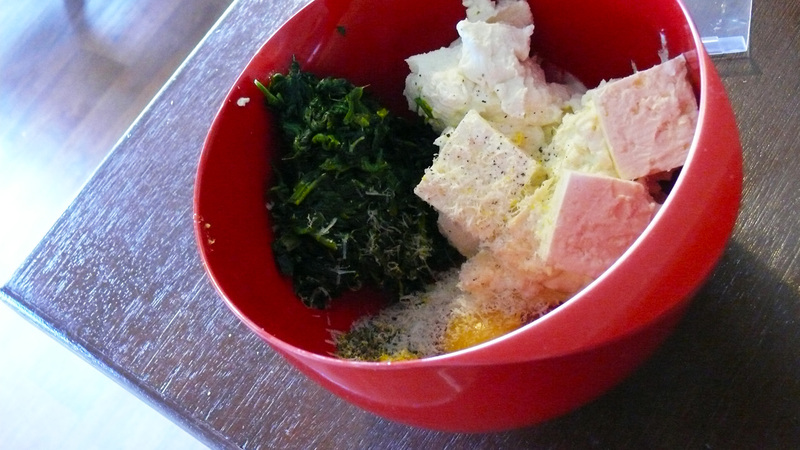 Combine ingredients for filling, but only half of the parmesan, in a large bowl. Set aside. Line a ceramic baking dish with baking paper. Spread a layer of tomato sauce across base. Lay one pasta sheet on chopping board. Pipe or spoon ricotta mixture onto sheet. 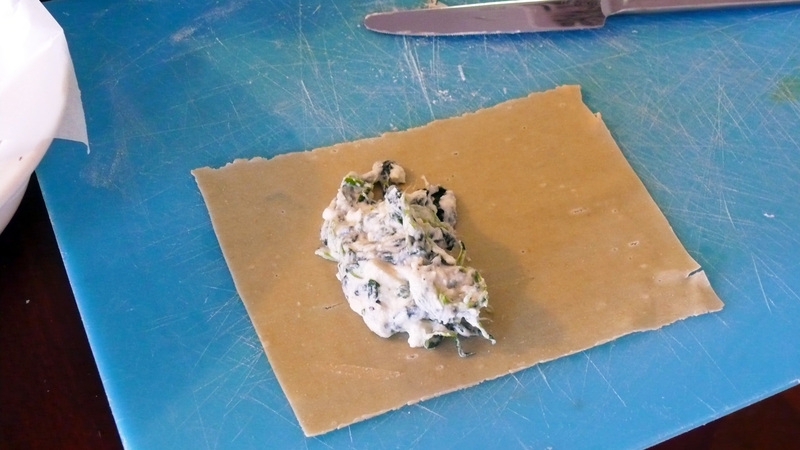 Roll to enclose filling and place cannelloni tubes in baking dish. Repeat until all filling and sheets are used. Spread remaining sauce over cannelloni tubes to cover. Grate some extra parmesan and sprinkle over cannelloni. Cover dish with foil and bake in oven for 30 minutes. Remove foil and bake for another 10-20 minutes or until cheese has melted. NOTE: If you pre-cooked your sauce and you’ve used it straight from the fridge, you may need to leave the cannelloni in the oven longer with the foil on. 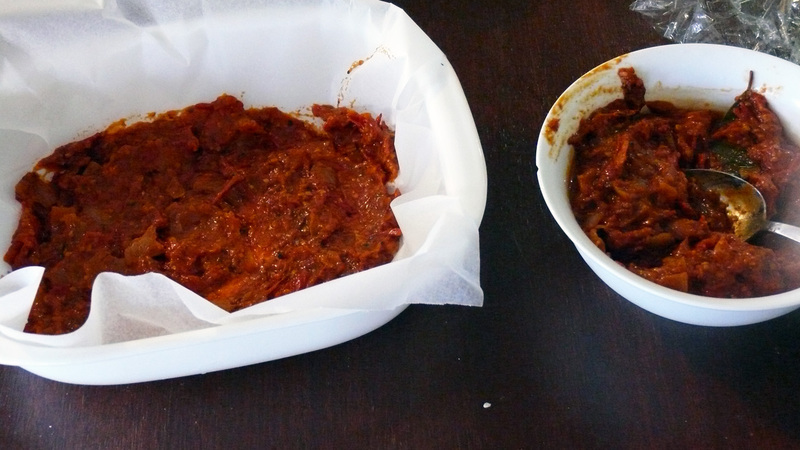 Extend cooking time with foil to an hour, 15 minutes without foil. This may need to be adjusted depending on the size of your baking dish, or you can cheat by microwaving your sauce before you assemble the cannelloni. And that’s it! Enjoy your cannelloni deliciousness with a side salad. It doesn’t make for the most amazing pictures (a bit like moosh, actually), but I think every mouthful is heaven on a fork! 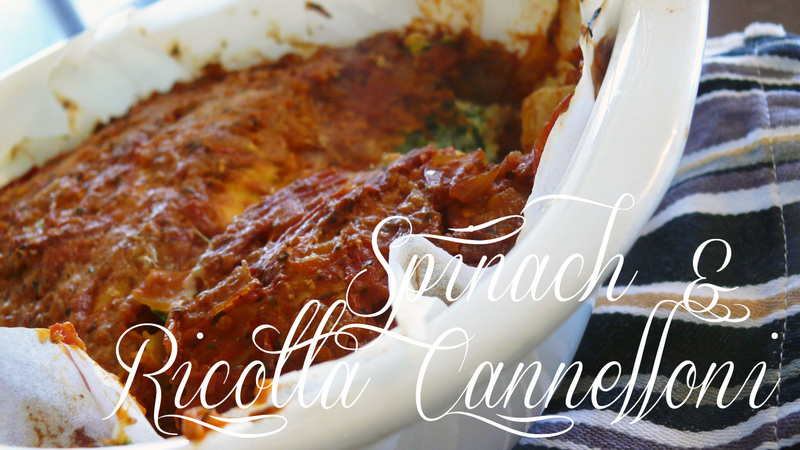 In the coming weeks, I will post my other favourite cannelloni recipe – roasted vegetable ratatouille cannelloni. That drool-worthy creation is time consuming as hell, but so damn worth it. I always make it when I have vegetarian guests – and cross my fingers that they don’t mind eggplant. I haven’t had any complaints, yet! 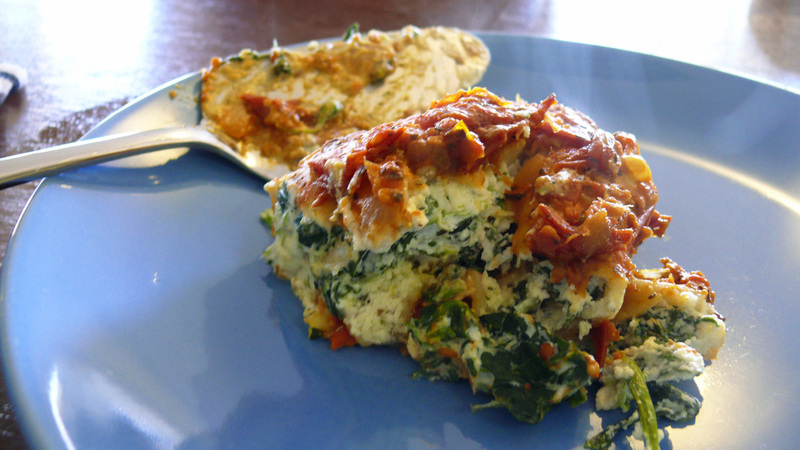 Something else I like to do is use this spinach and ricotta filling as a layer when I make lasagne. Basically I just chuck it in there with my bechamel sauce and bolognese. It works a treat! You can never have too many layers of cheese, in my opinion. But I am the girl who buys six to eight different kinds of cheese in her weekly grocery shop, so what do I know? If you make this recipe, I’d love to hear what you think. Please comment below! Happy cooking!